I think I’ve figured out the key to Jack’s schedule. Usually he wakes up sometime between 6-8 to eat, and usually I put him back in his crib afterward and he sleeps until 8:30 or 9. I’ve realized that he does sooooo much better if I just keep him up after that first feeding. Then not only is he ready for a nap around 10 (and a long one, too- two hours today! ), but he’ll take another substantial nap in the afternoon, too. Hello, Captain Obvious. I just thought he was a late sleeper… how nice that it only took me almost NINE MONTHS to figure this one out. 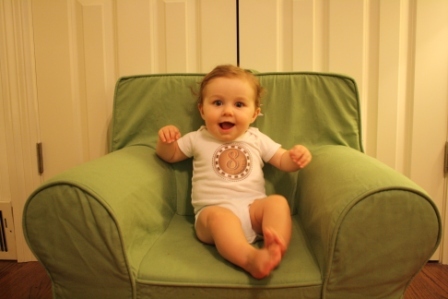 Speaking of, here’s his 8 month pic. And just one week shy of his 9 month birthday! Oh, he’s a squirmy one now!! It was so much easier to get good pics when he was just an adorable little stationary blob. Remember this? Back to the eats. I did okay today, barring the Sonic Cheddar Pepper that somehow made its way into my belly at Northpark. Breakfast = my old friend, yogurt. 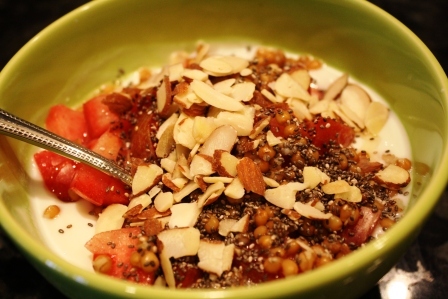 Topped with wheatberries (LOVE), a plucot, honey, chia seeds and almonds. The whole 2 hour nap thing is amazing. I didn’t know what to do with myself! I kept it classy by catching up on my Real Housewives of NJ. Any by the way, where the hell is Teen Mom tonight? 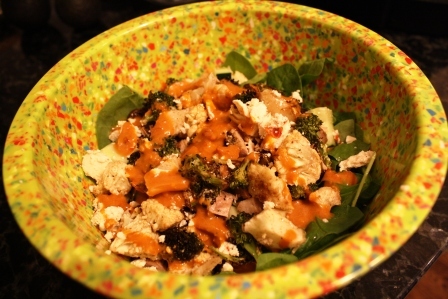 For lunch I made a giant salad with baby spinach, tomatoes, cucumbers and chopped pork tenderloin (from last night’s dinner), drizzled with red wine vinegar and Annie’s Woodstock Dressing. After lunch we headed to Whole Foods to wander the aisles. That place just makes me happy. I had Jack in the Bjorn and he actually pushed the cart in front of us. 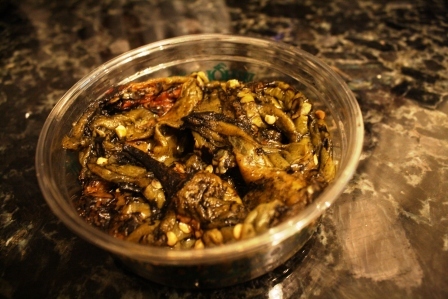 Roasted hatch chiles. All the grocery stores around here are brimming with them. I had a little lightbulb moment in WF when I decided to add these to the meatloaf that we were planning for dinner. The kicker was that I didn’t know how spicy hatch chiles are. Um, they have a definite KICK. 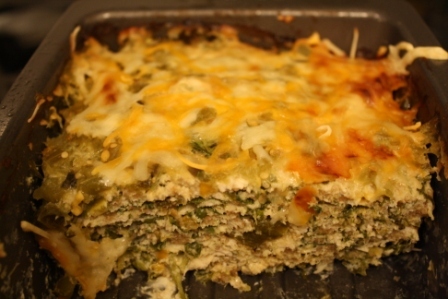 So though this recipe is delicious, be prepared!! 2. 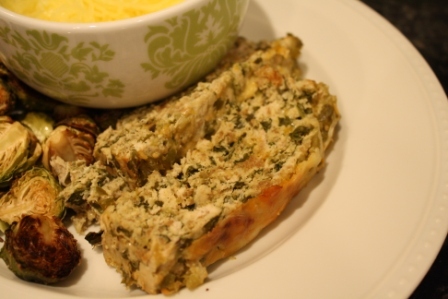 Combine turkey, spinach, 1/2 c of the salsa verde, bread crumbs (start with 1/4 cup- if it looks too “wet” add another 1/4 cup), 1/4 c of the cheese, green chiles, egg, Worcestershire, and spices to taste in a large bowl. Mix well and transfer to loaf pan. 3. 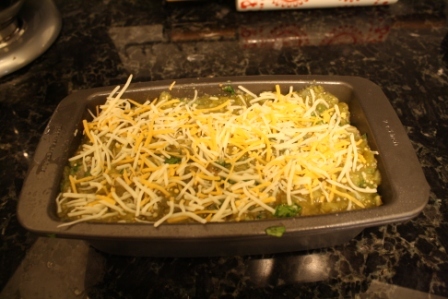 Smooth the top with a wooden spoon, then top with remaining 1/4 cup of the salsa verde. Then sprinkle on remaining 1/4 c of cheese. 4. Bake for 1 hour. Allow to cool for 10 minutes before slicing. 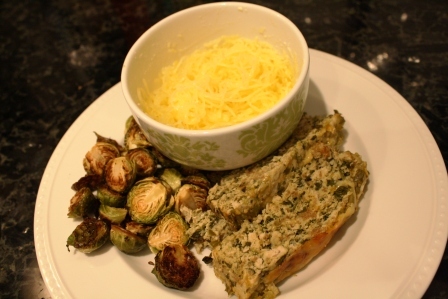 Along with roasted brussels sprouts (my fave) and spaghetti squash with butter and parmesan. After dinner we took a walk around the neighborhood, put Jack to bed, and now Brian is in the garage doing P90x while I become one with the couch. I’m pretty excited because the high tomorrow is only 88! I’ll believe it when I see it… but still. Exciting. This entry was posted in August 2010 and tagged Jack, Recipes, Turkey. Bookmark the permalink. Speaking of Teen Mom — I just watched last week’s episode and I have lost all respect for Farrah. And why didn’t the crew stop her from sending that $3000? Just insane. I love wandering the aisles of Whole Foods! 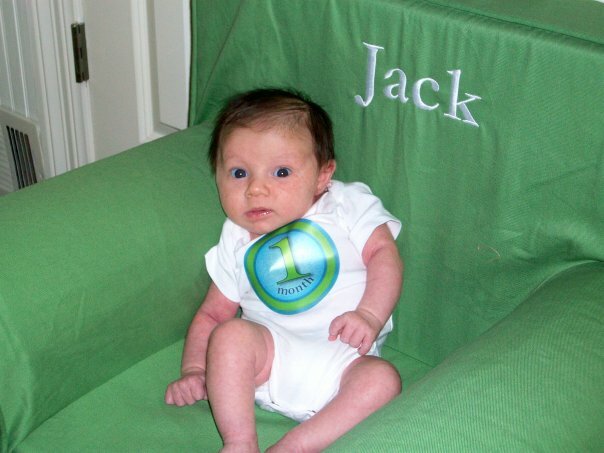 Cute Jack pictures, I can’t wait to do that every month as well!